The Grettenberger Farmhouse was the first building moved to the newly-developing Meridian Historical Village. Thanks to John Grettenberger, Sr. and his father, Orin, the donation of this Greek revival farmhouse truly launched the beginning of the Village. Originally built by Johann Grettenberger for his son, Jacob, and family between 1862 and 1865, the house was located on Marsh Road, between Hamilton Road and Grand River Avenue. The house was relocated to the Village in 1973. 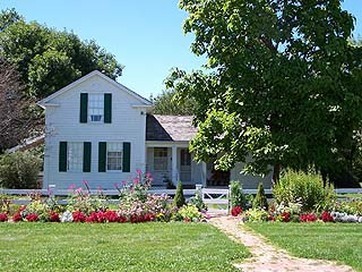 The house was restored to represent a typical Michigan farmhouse of the period 1870 - 1890. The house includes a parlor used to entertain guests, a kitchen/dining/sitting room that served as the "heart of the house", a parent's bedroom and a small child's bedroom on the first floor. The second floor contains a large child's bedroom which would have housed several children, and a front room that has been set up as a weaving or spinning room. A portion of the wall in the parlor was left unrestored to show how the building was constructed. After Mr. Grettenberger built the frame of the house, he split logs with an ax to create "lath boards" to build the base of the walls of each room. As split logs are not consistent in shape, there are gaps that remain between the boards. Therefore, it was necessary to mix up a batch of plaster to cover the lath boards, to which Mr. Grettenberger added horsehair to increase the strength and durability of the plaster. To this day, you can look up at the section left open and see horsehair protruding from the plaster....140 years later! So, how do we know when the farmhouse was built? During our restoration, we removed layer upon layer of old wallpaper until we reached the insulation layer. What did our ancestors use for insulation back then? Newspapers! The "insulation" found in the Grettenberger farmhouse all dated between 1862 and 1865. Hence, that was the time period of construction. This building is a historically significant structure because it is the first frame house ever constructed in the Village of Okemos. What does that mean? All the buildings constructed before this one were made of logs. This is the first building built with lumber from local sawmills. Built in 1849 by cabinetmaker Melzor Turner, it was located on Okemos Road just south of the "old" Grand River Road (now known as Hamilton Road). The house was originally used as a residence; however, a subsequent owner converted it to an inn and tavern because of its close proximity of the Lansing to Howell plank road.Later uses of the building included a post office, millinery shop, antique shop and, finally, office space for attorneys. In 1997, the Barnes House was slated for demolition in order to allow for the construction of a right-turn lane at the corner of Okemos and Hamilton Roads.An effort to save the house was championed by former Village Director, Paula Gangopahdya. Her tireless efforts at gathering local support and fundraising were instrumental in moving the building to the Village for restoration. Now completely restored, the front room on the south side of the first floor (right side with two windows) contains a "tavern" exhibit. Several artifacts were discovered during the excavation, including broken pottery and glass pieces, leather pieces, buttons, and broken metal pipes. One of the most important artifacts in our collection was a wooden box built by Melzor Turner! This box was in the possession of Jesse Turner, the great granddaughter of Melzor, which then found its way to Mrs. Gene McNitt, who then donated the box to the Friends of Historic Meridian. The Barnes House is the only building in the Village with a working kitchen and was remodeled in 2003 to a style more in keeping with the 19th century, and most recently in 2016 to create an office addition to house the Village staff. The Randall Schoolhouse, a one-room rural schoolhouse, was originally located in Conway Township, north of Fowlerville, Michigan. The Randall School was built in 1883, at a cost of $853.45, to serve grades first through eighth living in parts of Conway and Handy Townships in Livingston County. The school was continuously used until 1975, and then was used to store farm items (including corn) until the 1980's when it was slated for demolition. The Friends rescued the building and relocated it to the Village in 1987, where it is currently used to educate students about education in the 19th century. ​For information about our school tours, visit our School Tours page. 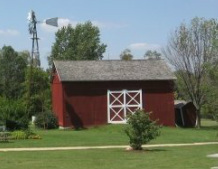 The Unruh Barn was built during the 1870s on the east side of Marsh Road, just south of Tihart Road. Two generations of the Unruh family used this barn, which was originally a two-story structure. The Eyde family donated the building in 1991 to add to the Village and complete the "farmstead" area of the Village. The building houses antique farming tools along with a blacksmith display. A corn sheller and grist mill are used inside the barn to teach school children how our ancestors took hard field corn and made it into finely ground cornmeal. Also known as "the Brick House", the Heathman-Herre House was built in 1877 by Wiliam H. Turner as a blacksmith shop for his son, Charles Turner. The building was originally located on the northeast corner of Hamilton and Marsh Roads in Okemos. According to oral tradition, Charles went to California looking for gold before ever starting his business. Later archaeological investigation of the site gave no evidence of any blacksmith activity. After Charles left for California, his father enclosed the large front opening with a door and two side windows, making it a village shop. The Brick House is two stories tall and, in its original construction, had no interior access to the second floor. There was an exterior staircase similar to the current one on the north side of the house. This staircase led to the second floor, known as "Turner's Hall", which was used as a meeting place by fraternal organizations such as the Odd Fellows Society. Early news accounts frequently mention the Grange Association used the second floor for information and social activities in this rural community. Traveling actors and musicians frequently stayed at the Barnes House Inn (also relocated to the Village) and performed at "Turner's Hall". Several families lived in the "Brick House" over the years. In addition to the Turner's, the Gottfried Herre and Walter Heathman families lived here. The last owner of the building prior to relocation was Keith Bartow, who taught music and operated a small musical instrument shop in the front room of the building. The building was moved to the Historical Village in 1988. At the time it was moved, it was estimated to weigh 248,000 pounds! The building was lifted on to a flat-bed truck and slowly moved from the corner of Marsh and Hamilton Roads to the Village in Central Park. As the truck came up over the curb in the park, one of the tires blew out and the truck had to be "jacked-up" to change the tire with the 248,000 pound building on top! Currently the building houses a general store exhibit and the village gift shop. The use of wooden plank roads was introduced by the State Legislature in 1848 to reduce the amount of time it took to travel to the City of Detroit from the new State Capitol in Lansing. The Lansing Central Plank Road Company was owned by Lansing merchants Jim Turner, Charles Seymour and Hiram Smith. They had the charter from the State to plank the route from north Lansing to Howell, where it connected with the road from Detroit. There were seven gates along the Lansing to Howell Road, each operated by a representative of the Lansing Central Plank Road Company. Houses accompanied the gates to serve as a gathering place for visitors, a place to drop off the local mail, and, of course, as the headquarters for the local operator of the tollgate. The Number 2 tollgate on the Lansing to Howell Plank Road was located on the south side of the current Grand River Avenue at Park Lake Road. The building was operated by the Proctor family and moved to the Historical Village in 1974. Although at one time there were many gates and houses, this modest building is the only tollgate house that remains in Michigan today! Please visit us to see this unique treasure! This local cabin, originally built in the early 1870's and owned by the Perkins family, was slated for destruction in 1971 when it was rescued by Robert Copland, then a teacher at Haslett Middle School. The owner at that time, MSU Professor VanDerJagt, donated the building to the Haslett School District and Mr. Copland moved the cabin to a wooded hill behind the school with the help of his students. Mr. Copland, along with fellow teachers Jane Taylor and Ray Koerner, used the building to teach outdoor education and pioneer living. The program was so successful; teachers from around the world came to see how the program was taught. Unfortunately, funding cuts ended the program and the building began to fall into disrepair. The cabin was only used twice a year: in the fall to show the kindergarten classes what "long time ago" was like, and in December for Christmas carols hosted by Haslett music students. Because the building was in a secluded, wooded location, vandalism became an on-going problem. An intentionally-set fire caused major damage to the second floor, which was subsequently repaired. The old logs were covered with graffiti and some were crumbling with rot. 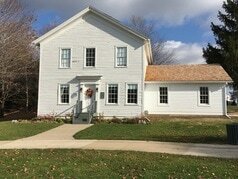 Fortunately, in 2005, the Haslett School District gave the cabin to the Friends of Historic Meridian in order to rescue, relocate and restore this historic building. After nearly two years of fund-raising, a contract was awarded in December, 2005, to disassemble, move, reassemble and restore the building.